A couple of weeks ago I took my daughter and met up with some friends, we had decided to walk up Carl Wark with the possibility of continuing on up Higger Tor. I wasn’t sure whether the kids were up to the walk but it pretty soon transpired that they were more than equal to the trek. 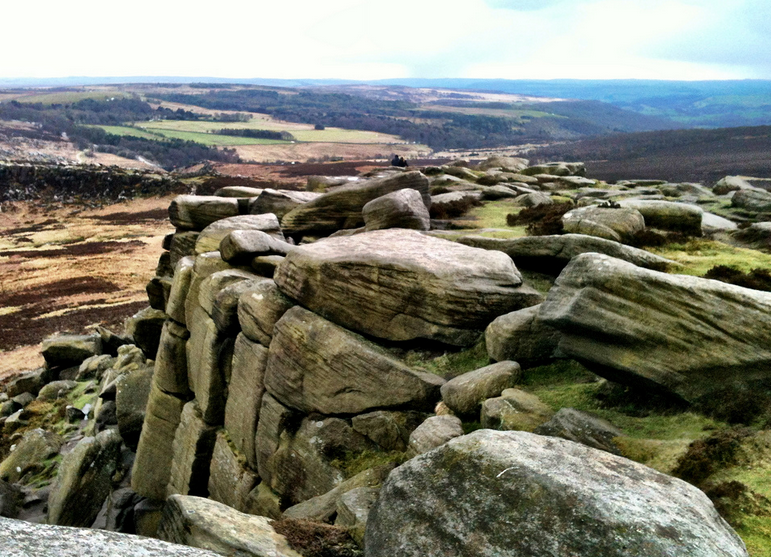 Carl Wark is a rocky outcrop on Hathersage Moor in the Peak District National Park, just outside the boundary of Sheffield. 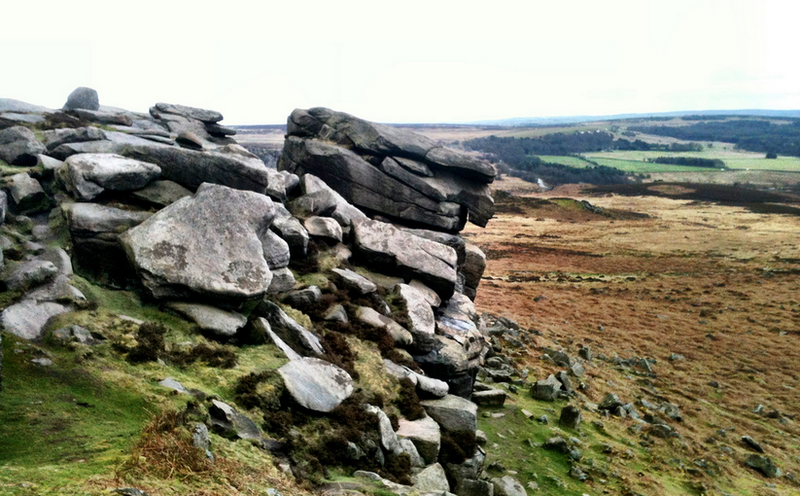 Carl Wark is basically a flat topped hill known as a promontory. It has rocky faces all round which are great for bouldering and scrambling. Apparently one side, is protected by a prehistoric embankment, but you wouldn’t really know that unless you knew what you were looking for. I first spotted Carl Wark as a boy, but had no idea what it was. Years later up on my return to the Peaks, it was one of the first places I sought out. One of the best routes to Carl Wark is to park at the side of the road by the Fox House inn. There is a style to a footpath that leads right over the fields and down towards the escarpments. As you head across the fields watch out because it can be a bit boggy in wet weather. Hopefully you’ll have some decent walking boots, Trainers (sneakers) will do, but will most likely get wet. After the bogs, you come to another stile, go over it and you come to a low rocky outcrop, great for kids and adults alike to climb and feel the bracing wind in your face. 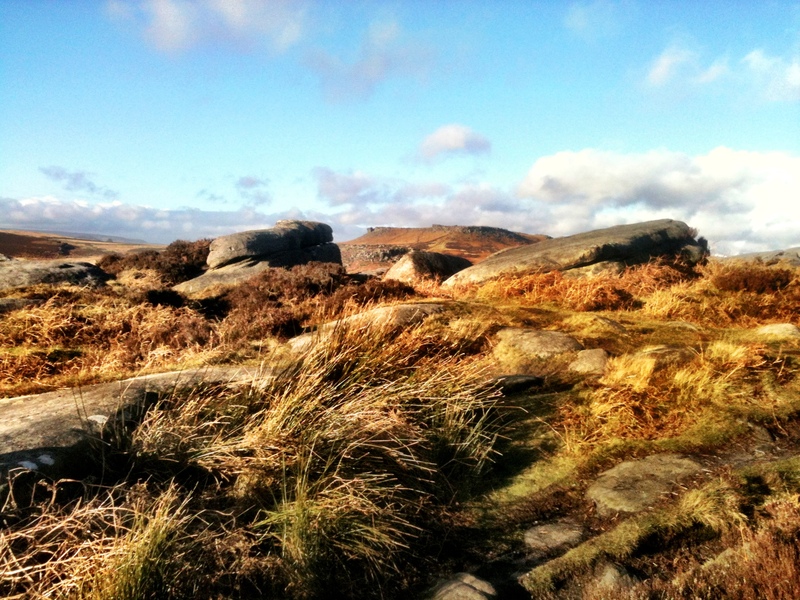 Walking towards Carl Wark, past the boulders. After the boulders, start to pick your way down the hillside, you’ll see a path below you. Once you get to the path you should be able to hear Burbage Brook. This is the fun part..cross the brook. It’s more than passable even after plenty of rain. Keep your wit’s about you though, because it’s possible to slip and fall in. At it’s deepest, the crossing point is about knee height, but slip over and you’ll get a wet bum for sure. After that, you are home free. Pick your way up to Carl Wark, watch out for the marshy ground again though. It looks a bit further away than it really is, you’ll be up there in minutes. Carl Wark is a suitable walk for children. My daughter about to conquer some more boulders. Once up on Cark Wark you’ll be windswept. I think this is a great place to sit down catch your breath, enjoy the view and maybe break out the Sandwiches. (Don’t forget to take your litter home with you though). After you’ve caught your breath, take a look around you, there are some terrific views. 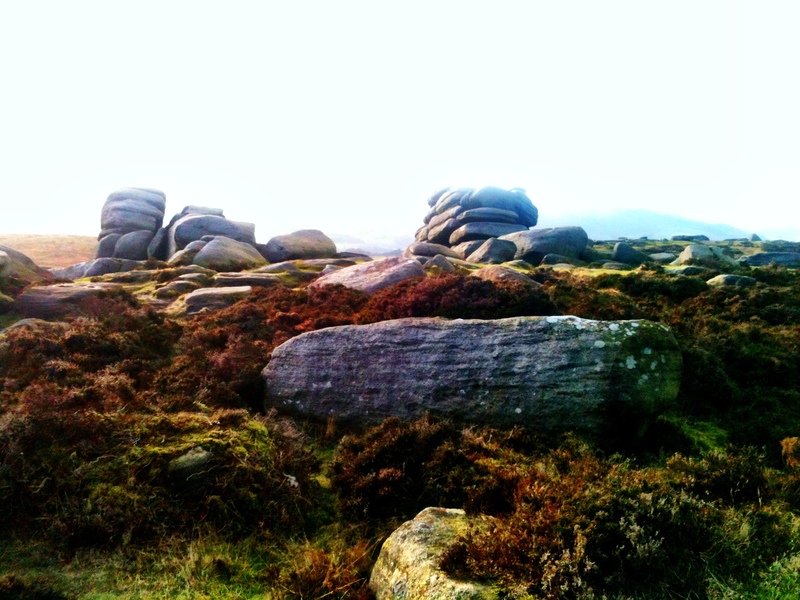 This will be when you set your sights on Higger Tor. Looking toward South Burbage Edge. view on Cark Wark – by @Tideswellman Instagram. 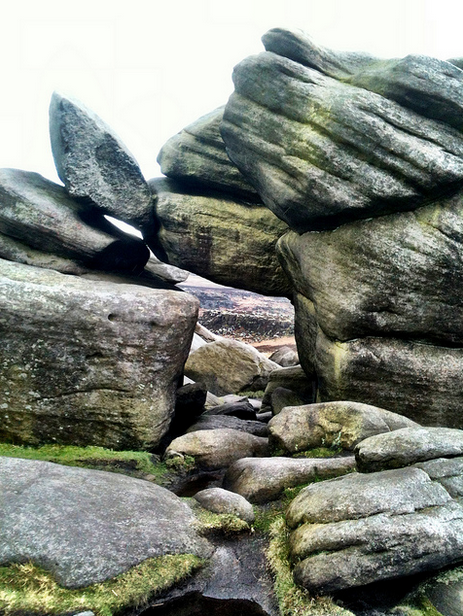 If you’re feeling tired, don’t worry Higger Tor will wait till the next time. 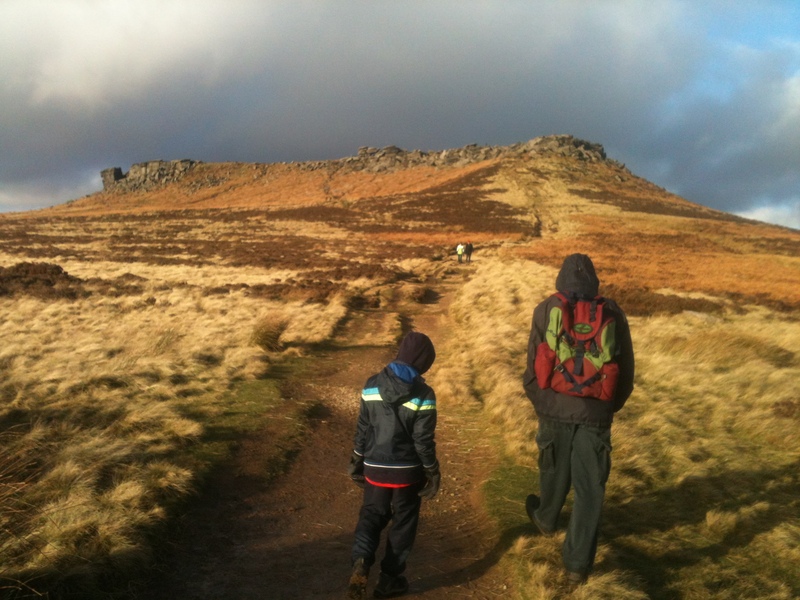 If however, you feel like pushing on, It took us (3 x 39 yr olds and 2 kids under 13) about 10 minutes to get from the top of Cark Wark to the top of Higger Tor, so it’s more than manageable. Once you get to the summit, you are greeted by more dramatic views. 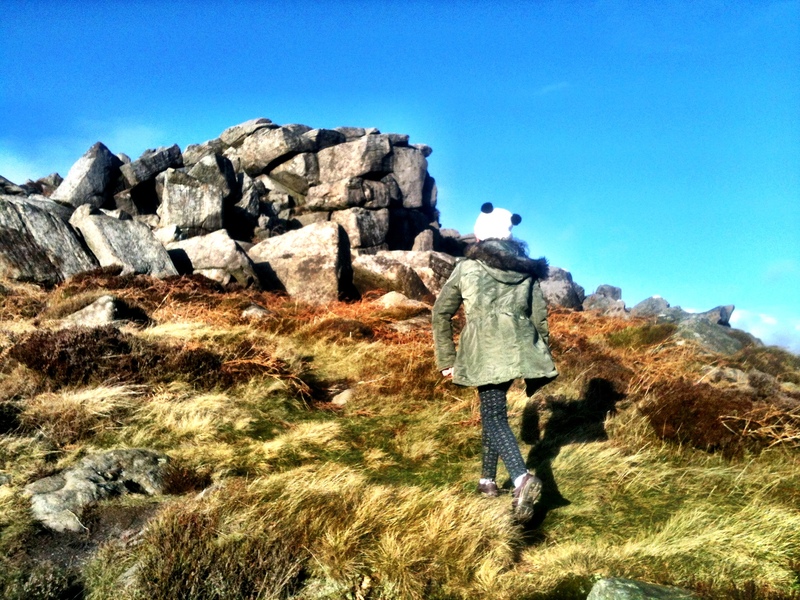 Huge tumbledown rockfalls, and weathered stacks make this walk one of the most engaging family walks around the area. Sensational to look at, fun to climb. If you enjoyed this article please leave a comment or follow my on Twitter, Instagram or Flickr.